The absolute first place to start when considering channel discounts is to survey the SPECIFIC market that you are entering. As illustrated in the diagram below, there are myriad combinations of market and channel. So by this I mean look at similar products being sold through the EXACT profile of channel partners you are considering selling through. For example for consumer software, retail gross margins of 15-18% are common, whereas for a specific VAR segments the normal discount structure may be in the 25-40% range. If your discounts fall too far below the market norm, your program will likely fail. If discounts are set much higher than the market norm (without good reason) your company will be “giving money away” and leaving considerable profits on the table. It is very important to do upfront research on actual conditions in your market segment and target channel partners–don’t just “assume” discount structures are the same as some other market segment you’ve been in previously! Preferably, you will want to find out what your direct competitors are offering in terms of a channel program. This may seem obvious. But I see often in my consulting practice many companies using their own theories or past experience to decide what the right discount structure SHOULD be, instead of using objective data gleaned from the current situation. This often ends up being the primary reason for a painful “restart” of their channel program at a later date. Channel discount structures cannot be constructed in a vacuum. They are but one component of your overall product, pricing and distribution strategy. As such, they must be consistent with the overall goals you establish for the product. For example, if you are seeking to penetrate a new market or a new channel, it may be wise to be more aggressive with your discount structure than the market norms to gain market share and shelf space. Conversely, if your market is more mature and you are in a harvest mode on a particular product line, it may be wise to minimize channel discounts to maximize profitability. In any event, make sure you consider channel discounts early in any product planning phase as part of your overall product marketing strategy. 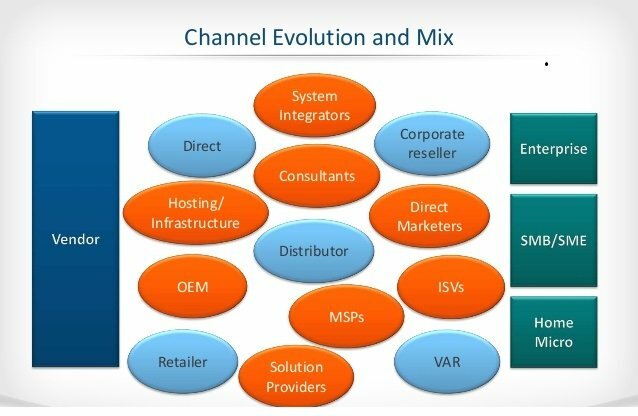 As discussed above, there are many different types of partners for software and hardware companies that fall into the category of “channel resellers”. Computer/electronics retail, mass market retail, Value-Added resellers (VARs), Systems Integrators (SI), Online Resellers, Domestic Distributors, International Distributors, Manufacturers Reps–and many more. Each of these reseller types are quite different from the others and each add different types and levels of value to your distribution systems. Yet every one that you distribute through will be competing with the others (as well as your direct sales model), at least indirectly. It’s important if you are selling through more than one channel (including direct sales) to attempt to equalize, as much as possible, the street prices charged by the various channel types. The best way to do this is to use a “value-based” approach. A simple way of doing this is to consider the costs incurred and value added by the various types of resellers in delivering your products to the target customer. For example, a VAR that provides technical support, pre-sales consulting, customization and other services may need a higher level of discount to achieve an adequate profit margin than a retailer simply providing shelf space might. In reality, the retailer is likely to have a lower street price, but it is important to try to minimize this gap with other channel partner types. Otherwise the VAR who may be providing important value-added services to a segment of your customers may be driven out of the market and refuse to sell your product–which is not in your company’s interests. Unlike the value-based approach described above, the most common practice (which causes inequities in channel pricing) is a volume-driven discount model. New entrants to the channel often use this approach–why wouldn’t you want to incentivize volume sales by giving the biggest discounts to the largest volume sellers? Although this may work if you have a monolithic reseller channel, where all the players have the same business model and offer the same value-add, it otherwise will quickly cause problems. The resellers possessing the lowest cost structure and usually also providing the lowest value-add will quickly dominate the market, driving the higher-cost/higher value-add resellers away. This may be ok with you depending upon the specifics of your product and market; just make sure you explicitly consider this possibility before embarking on a volume-driven channel discount strategy. As mentioned above, one of the things that I recommend considering explicitly up front is: what is the key value-add that you are seeking from the channel? Is it pre-sales consulting, installation services, customization, post-sale technical support, shelf space and inventory for immediate customer access, or one of many other factors? Make sure you understand which channel value-adds are most important to you and build protections into your discount structure for the reseller type who best provides this value. It’s not always necessary (or wise) to offer a single, monolithic discount level for resellers. How you structure your discounts components should be closely tied to your product and pricing strategy–what you are trying to accomplish with your overall channel strategy. For example, if you are trying to manage your street price at a certain level, it can be dangerous to offer a large discount to certain types of resellers who may pass that discount on as a lower street price. Yet this segment of resellers (for example, retailers) may be an important, high volume channel for your product type. In this case, it may be wise to offer additional, conditional discount for activities that you value. As an example, to keep your street price up but incentivize a high level of activity through retail, you could offer a higher level of additional discount for approved co-op marketing activities. A segmented discount structure driven by costs and value-add, rather than volume is often the most effective structure to maximize multi-channel sales. This will also limit discount-driven reductions in street price, which ultimately can severely reduce profit levels and incentives to sell, affecting not only all channel partners but ultimate the vendor as well–if not properly controlled. Creating a channel discount strategy and structure should NOT be a theoretical or “personal-preference” exercise. It should be an objective exercise based on a realistic view of market conditions and should include collection and analysis of available market data. While what you hope to accomplish with your discount strategy is important, the overwhelmingly most important factors in creating your discount strategy should be what is actually happening in your segment of the channel–and what will work best for your company. Try not to create a structure based on what you’d like to see with respect to the channel. Focus on creating a pragmatic, workable strategy upfront based upon facts on the ground, to avoid an unsuccessful channel entry and the painful program restructuring that results. If you are inexperienced in the channel game, seeking outside assistance may help you avoid experiencing one of these painful false starts that happen frequently to new channel entrants. That’s my view of how best to create a channel discount structure. I welcome you to post a comment with your own thoughts on this important tech company management decision.